Charlie Varon is one of those artists who are pretty much synonymous with the Marsh. 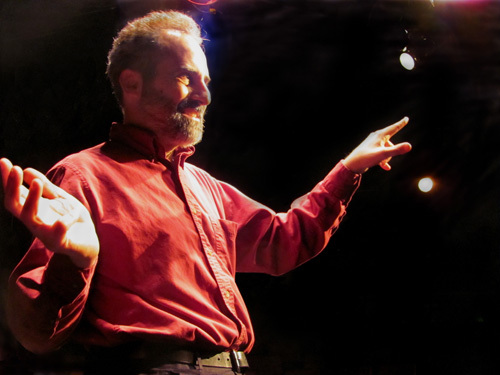 He’s been a mainstay and artist-in-residence at the hub for solo performance for more than 20 years, creating hilarious and thought-provoking multicharacter one-man shows from 1994’s Rush Limbaugh in Night School to 2009’s Rabbi Sam. Certainly not all of these have been in the same style, and his last show, 2012’s Fwd: Life Gone Viral, even brought in a second performer, Jeri Lynn Cohen. Even so, Varon’s latest piece, Feisty Old Jew, feels like a departure or a new direction. Charlie Varon in Feisty Old Jew. Photo by Myra Levy. It’s the first in a series of character portraits of…well, feisty old Jews, all residents of the same San Francisco retirement home. (Varon himself is only 55, and the characters are entirely fictional.) We meet some of the others in passing in this first installment, but we’ll get to know them better when they come to the foreground in subsequent shows. The titular feisty old Jew is 83-year-old Bernie Schein, a man who loves nothing so much as a good argument. In fact, I’d say he loves nothing but a good argument, except when he finds some other way of getting the better of other people. All his cherished memories are of times when he proved himself right at someone else’s expense. Raised in Brooklyn but a San Franciscan since in the 1950s, Bernie is a simmering stew of resentments, especially of young people and all the insipid hipster conveniences that have become the face of the city. Too impatient to wait for the cab he ordered on a hot day, he sticks out his thumb and hitches a ride to Marin in a fancy car with a trio of twenty-something dot-com types and surfers with a cappuccino maker in the dashboard. Bernie figures they just picked him up because they see him as a quaint local character, and he hates them all the more for that. After pretending to sleep to see what they say about him and plotting the best way to show his spite when he reaches his destination, he’s finally charmed to find one of his traveling companions is an author who once wrote an article that helped him win an argument about coupons, and that softens his attitude, if only a little. He’s charmed enough to stick around with the kids a while longer, if only to bilk them out of some serious money, betting $400,000 that he can ride a wave on his first ever attempt to surf (at 800-to-1 odds, meaning Bernie’s only out $500 if he loses). So what happens when this cranky old crank, who really has never surfed before, finally hits the water in Bolinas? Well, that’s the story. The funny thing about Feisty Old Jew is that it’s not a play at all. It’s an exquisitely crafted short story, complete with a third-person narrator. It’s just that Varon is such a superb storyteller that it still makes for captivating theater. In a lean and well-paced staging by David Ford—Varon’s collaborator of 23 years, with whom he’s developed all his shows—it’s a fast and furious monologue, and deceptively short for how fully realized it feels. Even with a substantial excerpt of his next work-in-progress—Fish Sisters, another story in the same series—as a light dessert after the main course, the whole show clocks in at less than an hour. What really makes the show shine (or Schein) is how fully realized the character seems in what’s really such a mercifully brief glimpse into his unforgiving psyche. The hard-edged glint of pleasure with which Bernie savors his list of pet peeves or plots the best way of showing other people up and bringing them down is a perverse delight. Bernie’s not an easy guy to like, but Varon’s performance is an easy one to love. Show #18 of 2014, attended February 23.